Are you a Donald Trump supporter who wants to change America but just can’t do it alone? Well, here’s one reason to rejoice, as you can enroll for a new dating service called Trump.Dating. Having just been launched, the site promises to deliver your very own Pro-Trump match. Have we gone from Make America Great Again to Make America Love Again? We have seen dating websites that help set you up with others based on their looks, interests, taste in music and movies, or even their financial well-being, but this one takes the cake. While the website indeed sounds crazy for those not totally behind Trump, it’s still a legitimate dating platform from what we can tell. 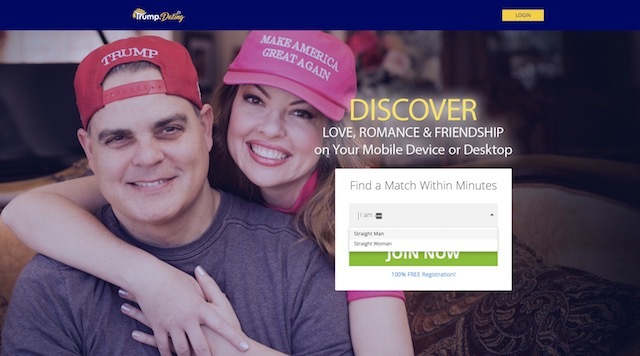 Trump.Dating might not be the first official dating website that hopes to match users based on their political views or support of Trump, but it’s still the first one that makes no bones about exactly the kind of demographic it’s targeting, and it’s trending in the US, for all the wrong reasons. The major controversy is that Trump.Daying only allows straight men and women to sign-up for the matchmaking service. While it doesn’t allow LGBTQ to join in, you can create an account if you are straight and happily married. The website offers options like “have a significant other,” “happily married,” and “unhappily married”. Naturally, people are angry about some of these policies, and a lot of them are taking their anger to Twitter. But controversies aside if you are a die-hard Trump supporter and a straight woman or man, you can try your luck on Trump.Dating to find someone just like you. Do let us know how you feel about such a service by dropping your thoughts in the comments section below.